What is an Internal Ribosome Entry Site (IRES)? 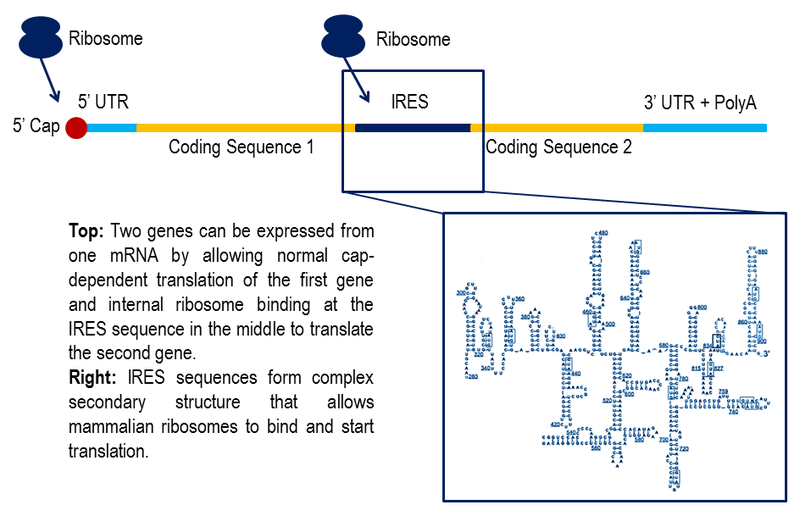 In a sentence: An IRES is an RNA sequence that forms a complex secondary strcuture that allows the initiation of translation from any position within an mRNA immediately downstream from where the IRES is located. In order to explain what an IRES is we must first consider their origin and natural function. The most commonly used IRES sequences used in protein expression are derived from the picornavirus family of viruses, which include polioviruses and foot and mouth disease viruses. When these viruses enter cells they are often inflammatory and can induce the expression of genes that will prevent virus gene expression such as interferons. They also, as most viruses do, want to convert the cell into factories for producing their own proteins. In order to this efficiently, these viruses express proteins that prevent ribosomes from engaging on mRNA molecules inside infected cells. This means that almost all protein production is stopped inside infected cells. However, the virus still needs to produce its own proteins and as such has evolved an RNA sequence that folds in a particular way that allows ribosomes to bind and start protein translation, independent of normal translation routes. This allows the virus to produce its proteins even though all 5’ cap-dependent translation has been inhibited within the cell. This also means that the virus is able to load ribosomes onto an mRNA from any region within an mRNA where the IRES is located. Hence why they are termed ‘internal’ ribosome entry sites. How can we exploit IRES sequences? For research, it is often desirable to express more than one gene from a stretch of DNA. The difficulty of predicting splice sequences, which would provide the ideal solution to this problem, has traditionally been made this hard to achieve. The observation that some viruses possess sequences that allow the loading of ribosomes for translation from ‘internal’ positions within an mRNA provided a potential solution. By positioning one coding sequence downstream of the 5’ cap/5’UTR in an mRNA, and a second gene downstream of an IRES sequence it is possible to allow the expression of two genes from a single mRNA (see figure below). The main IRES sequences used for the expression of exogenous genes are derived from Foot and Mouth Disease virus (FMDV) and Encephalomyocarditis virus (EMCV). The EMCV virus sequence is much more frequently used and consistently delivers slightly higher expression in the cell types we have tested. However, the EMCV virus sequence is longer than the FMDV virus sequence, which can be an important consideration in space constraint expression systems (lentivirus and adenoviruses for example). The position if the start codon of the gene is important but movement either side of the ideal position will normally be tolerable but may give slightly lower expression. Expression will vary from cell type to cell type and if using cells that are hard to transfect it can be difficult to use selection markers controlled by an IRES. For example, suspension immune cell lines are very difficult to select for with IRES systems. Often experiments are conducted in vivo, but also some published studies use in vitro transcription. Using in vitro transcription it is hard to determine how efficient the 5’ capping of the mRNA has been, therefore making comparisons between upstream gene and downstream gene levels hard to interpret. It is likely that IRES systems are saturable in vivo. For this reason, so if you produce 100 000 mRNAs from a CMV promoter but the IRES system in a given cell type can only load onto 10 000 mRNAs, the relative expression level from the upstream gene to the downstream gene will be around 10:1. However, if you use a weaker promoter, perhaps SV40, that might produce only 10 000 mRNA copies, the IRES system can load this many and so the ratio is now 1:1 between the upstream and downstream gene. We have not yet conclusively proven this, but it seems to explain the conflicting data in the literature. Measuring positive cells doesn’t measure protein levels. Often in the literature measurements are made using GFP by FACS. Then data is interpreted on the basis of positive cells. All cells expressing the upstream gene will also be expressing the downstream gene, so there will be a 1:1 ratio of expression. However, this does not mean there is as much of the upstream protein and there is of the downstream protein. In our studies we have focused mainly on total protein yield. In our studies, using a CMV promoter, the EMCV IRES produces between 10 and 20 fold less protein than the upstream gene, whilst FMDV IRES produces typically 20-30 fold less. Bacterial Origin Cloning: We currently have four alternative origins of replication for use in bacteria. Our bacterial origins of replication are normally flanked by two SwaI restriction sites. They will function if they are inserted in either orientation between these two sites. 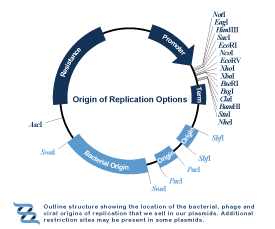 Phage and Mammalian Origin Cloning: We also have a range of other origins of replication, including the SV40 origin of replication for mammalian cells and the F1 phage origin of replication that can be used to create single stranded DNA. These are currently available in either the SbfI or PacI sites respectively, however, they can be inserted into other positions on request. Plasmids containing three transcriptional terminators all positioned downstream of the main multiple cloning site (MCS), including the SV40 PolyA signal, RrnG bacterial terminator and the T7 polymerase hair-pin terminator. This single terminator region provides flexibility when exchanging between mammalian, bacterial and phage systems. This system is present in the vast majority of our plasmids. Plasmids designed for expression in yeast contain the CYC1 terminator, together with the RrnG bacterial terminator and the T7 polymerase hair-pin terminator. We also produce plasmids containing a single terminator downstream of the MCS, namely the SV40 polyA mammalian terminator (product OG176), RrnB bacterial terminator (Product OG179), RrnG bacterial terminator (Product OG180) or the T7 polymerase hair-pin terminator (Product OG177). The reason that we stock plasmids that only contain one terminator is because sometimes, despite the increased versatility, researchers may not want unnecessary terminators in their plasmids, for example when size constraints are an issue. The button below takes you to the plasmids with single terminators. If you prefer to use a plasmid with triple terminator, we suggest you search using the Plasmid Seach tool since nearly all our plasmids have triple terminators. The Plasmid Search tool will give you access to our full plasmid catalogue. Finally, please try the 'Design Your Own Plasmid Online' button below, to see what our cloning system can do for you. And remember that, while our plasmids are designed for easy cloning modifications, we are happy to do it for you if you prefer to outsource the cloning work.